A Very Happy Thanksgiving to my Canadian readers! There is nothing better than this holiday. Not only does it kickstart the Fall/Winter Holiday season, but also, gives us an opportunity to celebrate and reflect on the blessings we have in our collective lives. And blessings come in all shapes and sizes: the strength and support we garner from family and friends, the laughter of little children, the food on the table, the roof over our heads, the wonderment of nature, the smile of a stranger – well, you get the idea. And no where did I mention fame and fortune. One cannot buy happiness. One has to make a concerted effort to install happiness in our lives by creating for ourselves a peaceful and loving environment. I know, for many, this can be difficult. But, believe me, there are people out there ready to embrace you if you feel lonely and disenfranchised. A Church, a support Group or Home, a counsellor (one who is grounded with a spiritual and moral fibre). Sometimes it takes courage to accept that you need to make a change and I am here to tell you that this song will give you purpose and stemgth. For this reason , “Count Your Blessings”, in its simplicity and beauty, has always meant a great deal to me and so many others. It was written by Irving Berlin for the 1954 movie, “White Christmas”, which centres around life after World War II. It is a romantic comedy to be sure, but it is more than that. The movie and this song, in particular, delivers a strong message of unity and love in the face of hardship and violence. For this reason, this movie is still revered by millions of fans around the world, myself included. And, with the tragic event unfolding in Las Vegas a little over a week ago, we need, more than ever, to draw on the strength and security we can gain from others. We are all family – united in one cause – to achieve tranquility and stability in our daily lives. To grab on to the blessings we have in our lives. To reach out to a lonely or depressed individual with a friendly word or gesture. When I researched the video accompanying this article, I was struck by the comments under the video on YouTube. So many people expressed a desire to live back in this era, some saying that this song made them cry each and every time. Maybe this is the reason that, as a 7-year-old child, my Dad had to drive me three separate times so I could see this movie. Even children “get it”and need it. 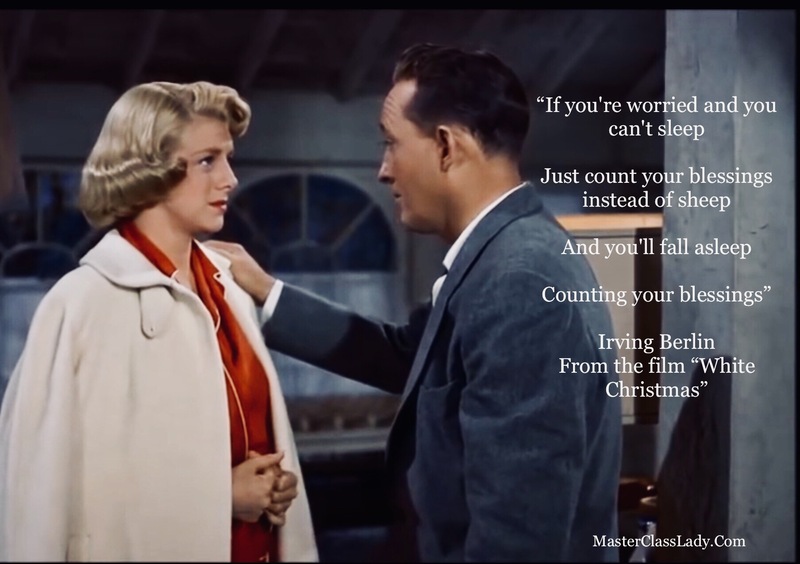 I was obsessed with this movie and the characters in this song,as portrayed by Bing Crosby and Rosemary Clooney, were so authentic. Their relaxed, nuanced voices cover my being like a warm blanket on a cold frosty morning. Thank Heavens I was blessed with wonderful and nurturing parents. I feel that this movie shaped me and , this song in particular, gave me a sense of peace. And this is what I wish for each and every one of you today. Peace and happiness in the days ahead, surrounded only by life’s greatest blessings. Please feel free to share your thoughts and your greatest blessings in the comments section below.